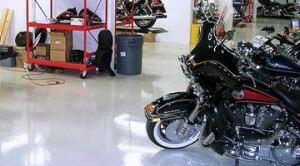 Slip resistant epoxy flooring and other coatings are required by most facilities, and with good reason—virtually all spaces, both commercial and industrial, are susceptible to the high risks associated with a wet or dry slippery floor. Our slip resistant flooring and coatings come in a variety of finishes, from the very mild to coarser textures, and are installed according to your specific needs. From rainwater to grease and oil, from spilled powders to dropped plastic wrap, our flooring helps provide a level of protection against a broad range of dangerous conditions. No matter what the industry or the way that your space is used, our slip resistant flooring can significantly help reduce your risk of dangerous slip-and-fall events. Slip resistant flooring from Florock, including concrete epoxy polymer floor coatings, toppings and resurfacing systems, can help prevent slips and falls in the workplace. Since slip-and-fall accidents are among the most common workers’ compensation claims filed across a wide range of industries, it’s essential that everything possible be done to help make facility flooring safer for workers and visitors alike. 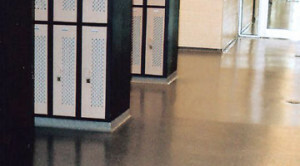 Our slip resistant flooring is available in a variety of finishes and textures, and can be installed to accommodate the specific activities taking place within each space within your facility, including more aggressive floor profiles for busy traffic lanes, locations where substances are regularly splashed or spilled or where high viscosity liquids and gels may be present. Our approved installers are experienced in balance the right level of slip resistance with easy cleanability, to ensure your maintenance routines and other operations are fully accommodated. Increasing safety on all walking surfaces is a high priority for mitigating risk. Luckily, the overall design vision need not be sacrificed. An attractive, slip-resistant floor surface can provide an aesthetically pleasing appearance, from shimmering metallic finishes to multicolored quartz aggregate flooring systems that are both decorative and exceptionally durable. Seamless slip resistant flooring systems provide a more sanitary environment, of particular concern in the healthcare industry. From high gloss options to flooring systems that can economically repair deteriorated concrete floors, to slip resistant flooring systems that meet the current trends in color, design, and surface texture, nearly every option is available. Your operation can have an attractive, durable walking surface with customized slip resistance as part of a facility-wide safety program. Helping to reduce the risk of slip accidents in your facility is important and so is your budget. With the cost of accident claims, absenteeism and work missed due to injury, having the right floor systems in place is the only practical choice. Florock’s value-based slip resistant concrete flooring selection offers something for every budget. We’re as dedicated to your building occupants’ safety as you are and want to help you and your staff select the flooring that works best for your operation and finances. Our highly experienced team of experts helps ensure that you get the optimal interior traffic surface and value you require. Whether you need a decorative high performance floor or a simpler, more utilitarian look, all of our slip resistant epoxy flooring and other coatings can be installed to your exact specifications. Florock’s slip resistant flooring systems help to provide a safer environment, and can be customized for industries with specific needs, such as those mandated to include a higher level antimicrobial protection. Concrete coatings with slip resistance furnish added protection and durability for facilities with high traffic areas. From the highly decorative to the most utilitarian applications, we offer a broad scope of options to meet the toughest specifications, for virtually any industry. In addition to maintaining the aesthetics of your floor surface, our anti-skid industrial concrete floor systems are formulated to work with your cleaning operations. We determine the best resin formula based on your existing maintenance routines, accommodating everything from steam cleaners and riding scrubbers to a simple mop and bucket. No matter what industry you’re in, our slip resistant flooring solutions can help prevent dangerous slips, trips and falls. And well selected, properly installed epoxy flooring and coatings can support your overall facility safety program for years to come. When searching for your next flooring solution, consider Florock’s wide range of fully-customizable slip resistant options.